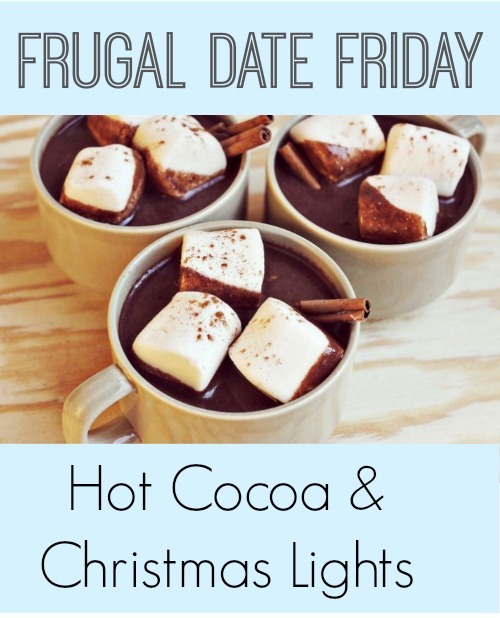 This week for Frugal Date Friday we are going to warm things up with Hot Cocoa! You can then load up the car and go see the best Christmas lights your city has to offer. You can drive around to see household displays or head somewhere like the Lights at Saluda Shoals, Hollywild, or Christmas Town USA. If you are going somewhere that charges per car, you can invite another couple along to split the cost. There are so many fun options this time of year! For a healthy and frugal Hot Cocoa recipe, you can use this Organic Hot Chocolate Recipe. Fill up a mug (like lids) and head out. You could even bring along some Christmas cookeis. If you want to bring out your inner Clark Griswold, you can decorate your own home with lights. To make the date even more fun, watch Christmas Vacation before or after.